Hydroxychloroquine (HCQ) in recent times has been used in treatment for a variety of autoimmune diseases and dermatological and rheumatological conditions. Retinal toxicity from HCQ and its analog chloroquine has been recognized for many years. Retinal toxicity secondary to HCQ is irreversible and can continue to progress even after cessation of therapy. Prompt screening and serial monitoring, with the utilization of imaging modalities, is of paramount importance to early detection. Chloroquine (CQ)-induced retinal toxicity was first described in 1959, and the retinal toxic effects of hydroxychloroquine (HCQ) were later described in 1967., The risk of retinal toxicity with CQ appears to be significantly higher than with HCQ, and the safe daily dose and cumulative dose are less clear., For this reason, CQ should only be considered if other drugs have failed to control the disease adequately. HCQ which has largely replaced CQ has been used widely for the treatment of systemic lupus erythematosus, rheumatoid arthritis, and other inflammatory and dermatologic conditions. In fact, HCQ is estimated at having a 0.5% incidence of retinal toxicity after 5 years of therapy., A small percentage will develop irreversible and potentially progressive retinal toxicity, for which no effective treatment exists. Objective changes typically precede complaints of visual loss. Therefore, baseline comprehensive ophthalmological evaluation is warranted before starting these drugs to determine preexisting maculopathy. Patients with underlying macular disease may be at higher risk for toxicity; maculopathy masks the signs of early toxicity and renders screening less effective or impossible. The mechanism of CQ and HCQ retinopathy is not well understood. Histologic examinations and animal experiments have shown that the earliest changes occur in the cytoplasm of ganglion cells and photoreceptors with later involvement of the retinal pigment epithelium (RPE), where it binds to melanin. The major pathogenic effect of HCQ is the induction of lysosomal dysfunction in photoreceptors and RPE cells which leads to the accumulation of lipofuscin in RPE. Melanin binding increases the concentration of the drug in retina and further contributes or prolongs the toxic effects. The macular localization of the disease suggests that light absorption or cone metabolism may play a role. Obesity is a risk factor due to improper dosing, rather than a specific risk. The recommended doses are based on ideal body weight. Kidney and liver disease predisposes to HCQ toxicity due to impaired clearance of the drug. Old age is hypothesized to contribute to overall risk due to the natural aging process of the RPE, causing the RPE to be more sensitive to toxic drugs. 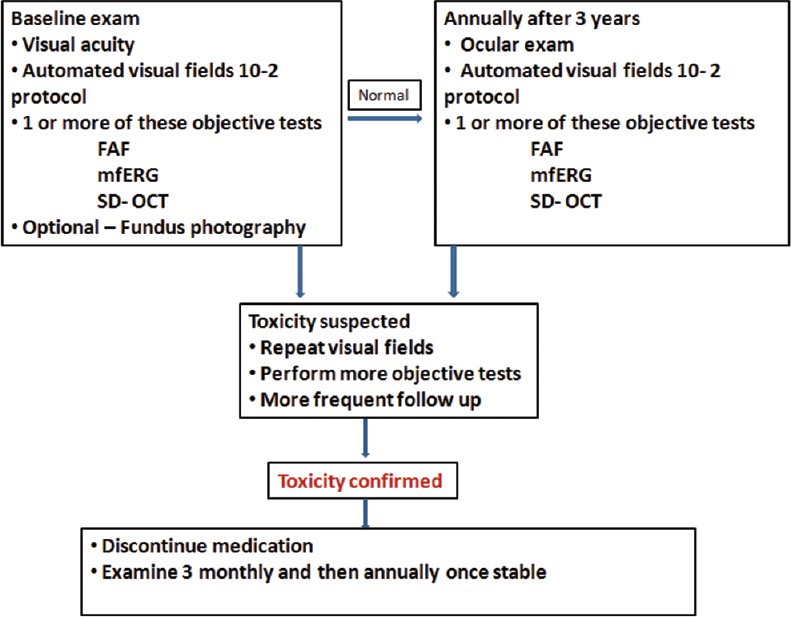 The major risk factors of retinal toxicity have been summarized in [Table 1]. CQ can precipitate in the corneal epithelium in a diffuse punctate or whorl-like pattern which can sometimes result in visual haloes. The finding of corneal verticillata bares no correlation with retinal toxicity and is not an indication to stop the medication. This is much less common with HCQ than with CQ. The effect is reversible on stopping the drug., In early stages, patients are usually asymptomatic though rarely may note a paracentral scotoma that causes trouble with reading as well as diminished color vision. When allowed to advance, HCQ retinal toxicity leads to loss of up to three visual functions: acuity, peripheral vision, and night vision. The hallmark of HCQ toxicity is pigmentary retinopathy. It is caused by buildup of the systemic drug, and thus the findings are bilateral and symmetric. 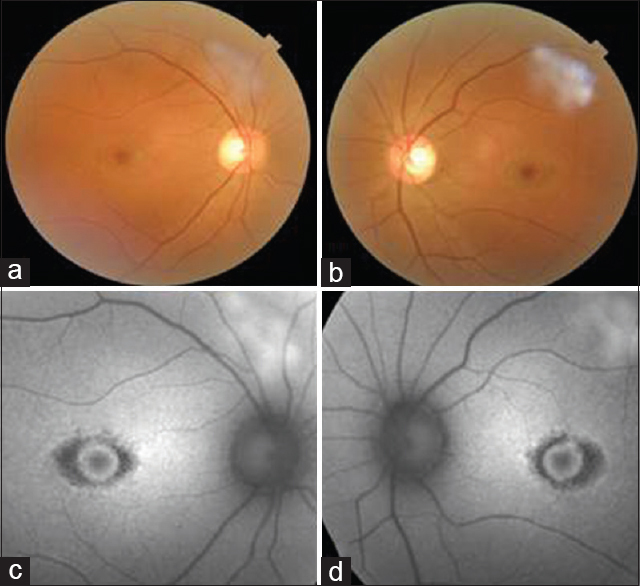 The early signs of HCQ toxicity are macular edema and/or bilateral granular depigmentation of the RPE in the macula. Here, fine pigmentary mottling within the macular area with or without loss of foveal reflex is the first visible evidence of CQ retinopathy. Even before visible ophthalmoscopic changes are detectable, a “premaculopathy” state can exist, in which the drug interferes with metabolism of the macular tissues causing subtle visual field defects. The various stages of retinopathy due to CQ have been summarized in [Table 2]. With continued exposure to the drug, this can progress to an atrophic bull's eye maculopathy with concentric rings of hypo and hyperpigmentation surrounding the fovea as shown in [Figure 1]., Bull's eye maculopathy is indicative of fairly advanced stage of retinal toxicity that is largely irreversible despite cessation of the offending medication, causing widespread atrophy. At this point, attenuation of retinal arterioles and optic disc pallor may be evident. In advanced stages, well-circumscribed area of RPE atrophy in the macular area may resemble a macular hole. High degree of bilateral symmetry is noted, but occasionally one eye can be affected more than the other. A task force of the American Academy of Ophthalmology (AAO) published screening guidelines in 2002. The risk of toxicity is not precisely known but was traditionally reported to be <0.5%., Newer literature suggests that the true risk may be substantially higher. A new study, comprising almost 4000 patients, reported that after 5–7 years of usage, the risk approaches 1% and continues to rise with prolonged exposure. A greater overall risk of toxicity (above 1%) is believed to justify a more aggressive screening algorithm. There have been reports of patients with HCQ toxicity as early as 1.9 months of treatment. The goal of screening is early detection of toxicity to avoid serious vision loss. The frequency of screening has to be tailored taking into consideration the mentioned risk factors in [Table 1]. A number of tests can objectively document anatomic or functional damage from CQ or HCQ, and these can be extremely useful in verifying and quantifying toxicity. However, there are limited studies comparing sensitivity and specificity of these procedures relative to automated visual field testing,, and the optimal test or combination of tests is still unknown. The various investigations recommended include. 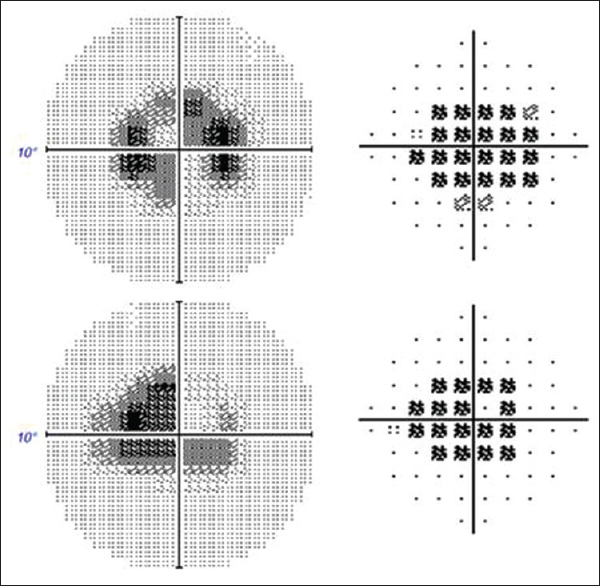 Always look for subtle paracentral visual field defects, 10-2 white pattern deviation plots or red 10-2 fields can be done which show a loss of sensitivity 2°–6° off-center and is very significant [Figure 2]. Even the most subtle change should be thoroughly evaluated with additional objective testing. In progressive disease, patient usually will have paracentral and central or foveal defects, whereas in late stage or advanced disease, there is paracentral scotoma. As per the latest guidelines (AAO, 2016), automated field test should be tailored according to the race of the patient. A 10-2 field evaluation is used in non-Asian population for screening. This is in accordance to the study conducted by Melles et al., in Asian patients, the damage starts in the extramacular regions of the retina near to the arcades. Hence, the current recommendation is to perform HVF 24-2/30-2 field testing for screening in the Asian population. 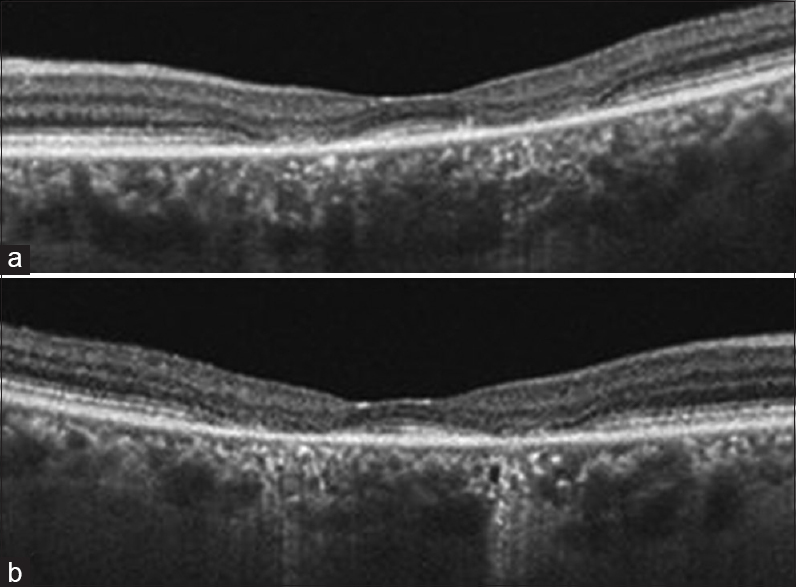 Spectral domain-optical coherence tomography (SD-OCT) in the early stages can show localized thinning of the retinal layers in the parafoveal region and confirm toxicity. Stepien et al. described a “preclinical” stage of HCQ toxicity where the photoreceptor inner segment-outer segment (IS/OS) junction appears “moth-eaten” due to preferential loss of cone photoreceptors. Another finding that has been described is the preservation of the outer retinal structures in the central fovea, perifoveal loss of the photoreceptor IS/OS junction, and outer retinal thinning. Chen et al. named this unusual finding as the “flying saucer” sign [Figure 3]. Multifocal electroretinography (mfERG) may show “moat around a small hill” appearance. HCQ toxicity first affects small areas of the retina between 5° and 15° from the fovea [Figure 4]. It allows the detection of localized paracentral ERG depression in early HCQ retinopathy. Furthermore, when associated with increased implicit times, these paracentral amplitude reductions are more specific for HCQ retinopathy.,, Latest reports suggest that serial mfERGs may detect decreased retinal function even earlier than other modalities in patients with otherwise normal clinical examinations. There is no treatment to reverse HCQ toxicity. Although cessation of the medication is recommended, visual function rarely recovers, especially in the later stages of the disease. Keratopathy and premaculopathy are fully reversible, whereas true bull's eye maculopathy is irreversible. However, continued deterioration in visual function can occur for a year after discontinuing HCQ, possibly due to slow clearance of the medication from the retina and body. This prolongs the half-life of the drug. In fact, the drug can still be detected in the blood and urine of patients 5 years after cessation of therapy. The goal of screening is to detect early asymptomatic evidence of toxicity even though there are no clearly defined parameters for the diagnosis of early toxicity. Once toxicity is documented, discontinuation of medication should be considered, in cooperation with the patient and the internist or rheumatologist prescribing the drug. Patients should be advised that toxicity may progress despite discontinuation of medication, and the etiology of this progression is poorly understood. Please follow an algorithm based approach to manage HCQ toxicity as shown in [Figure 5]. Hobbs HE, Sorsby A, Freedman A. Retinopathy following chloroquine therapy. Lancet 1959;2:478-80. Shearer RV, Dubois EL. Ocular changes induced by long-term hydroxychloroquine (plaquenil) therapy. Am J Ophthalmol 1967;64:245-52. Marmor MF, Carr RE, Easterbrook M, Farjo AA, Mieler WF; American Academy of Ophthalmology. Recommendations on screening for chloroquine and hydroxychloroquine retinopathy: A report by the American Academy of Ophthalmology. Ophthalmology 2002;109:1377-82. Levy GD, Munz SJ, Paschal J, Cohen HB, Pince KJ, Peterson T. Incidence of hydroxychloroquine retinopathy in 1,207 patients in a large multicenter outpatient practice. Arthritis Rheum 1997;40:1482-6. Bernstein HN, Ginsberg J. The pathology of chloroquine retinopathy. Arch Ophthalmol 1964;71:238-45. Mahon GJ, Anderson HR, Gardiner TA, McFarlane S, Archer DB, Stitt AW. Chloroquine causes lysosomal dysfunction in neural retina and RPE: Implications for retinopathy. Curr Eye Res 2004;28:277-84. Kellner S, Weinitz S, Kellner U. Spectral domain optical coherence tomography detects early stages of chloroquine retinopathy similar to multifocal electroretinography, fundus autofluorescence and near-infrared autofl uorescence. Br J Ophthalmol 2009;93:1444-7. Marmor MF, Kellner U, Lai TY, Lyons JS, Mieler WF; American Academy of Ophthalmology. Revised recommendations on screening for chloroquine and hydroxychloroquine retinopathy. Ophthalmology 2011;118:415-22. Wolfe F, Marmor MF. Rates and predictors of hydroxychloroquine retinal toxicity in patients with rheumatoid arthritis and systemic lupus erythematosus. Arthritis Care Res (Hoboken) 2010;62:775-84. Yam JC, Kwok AK. Ocular toxicity of hydroxychloroquine. Hong Kong Med J 2006;12:294-304. 11. Lai TY, Ngai JW, Chan WM, Lam DS. Visual field and multifocal electroretinography and their correlations in patients on hydroxychloroquine therapy. Doc Ophthalmol 2006;112:177-87. Lai TY, Ngai JW, Chan WM, Lam DS. Visual field and multifocal electroretinography and their correlations in patients on hydroxychloroquine therapy. Doc Ophthalmol 2006;112:177-87. Marmor, Michael F. Recommendations on Screening for Chloroquine and Hydroxychloroquine Retinopathy (Revision). Ophthalmology 2016 123:1386-94. Melles RB, Marmor MF. Pericentral retinopathy and racial differences in hydroxychloroquine toxicity. Ophthalmology 2015;122:110-6. Stepien KE, Han DP, Schell J, Godara P, Rha J, Carroll J. Spectral-domain optical coherence tomography and adaptive optics may detect hydroxychloroquine retinal toxicity before symptomatic vision loss. Trans Am Ophthalmol Soc 2009;107:28-33. Chen E, Brown DM, Benz MS, Fish RH, Wong TP, Kim RY, et al. Spectral domain optical coherence tomography as an effective screening test for hydroxychloroquine retinopathy (the “flying saucer” sign). Clin Ophthalmol 2010;4:1151-8. Kellner U, Renner AB, Tillack H. Fundus autofluorescence and mfERG for early detection of retinal alterations in patients using chloroquine/hydroxychloroquine. Invest Ophthalmol Vis Sci 2006;47:3561-8. Maturi RK, Yu M, Weleber RG. Multifocal electroretinographic evaluation of long-term hydroxychloroquine users. Arch Ophthalmol 2004;122:973-81.